The National U.S.-Arab Chamber of Commerce (NUSACC) accepts internship applications for the Fall, Winter/Spring, and Summer academic terms on a rolling basis. We are seeking dependable interns who are creative, self-motivated, and able to work both collaboratively and independently. 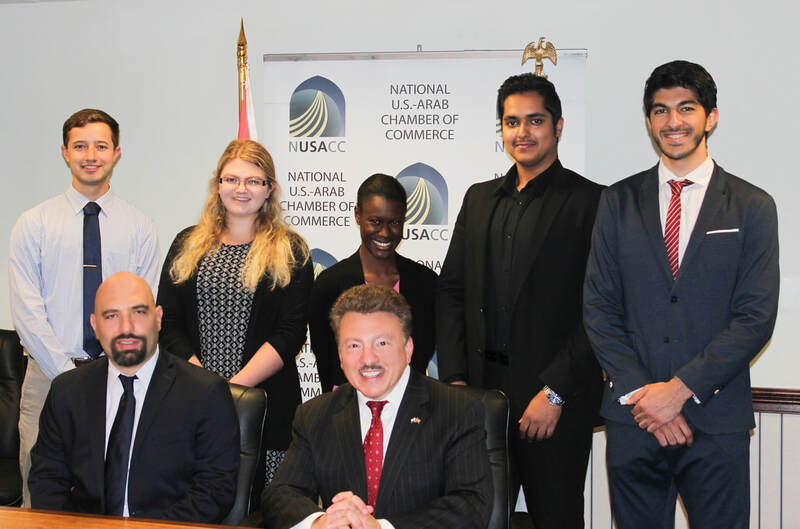 NUSACC internships offer the opportunity to learn about and network with Arab diplomats, U.S. government officials, and representatives of leading companies and organizations with business interests in the Arab world. NUSACC offers flexibility in terms of hours and start date. While internships at NUSACC are unpaid, they may be used to satisfy academic and/or community service requirements. Conduct research as needed by the Chamber on topics related to U.S.-Arab trade. Research U.S. trade policy, U.S. companies, and local chambers of commerce in various states and cities that provide potential opportunities for foreign business and governmental delegations. Participate in (and provide read-outs of) events hosted by organizations focusing on the Middle East and North Africa. Assist with planning and recruiting for Trade Missions from and/or to the region. Database management and administrative support on an as needed basis. Assist with planning, publicizing and execution of NUSACC events. Minor translation of Arabic, French, and/or English text, as needed and as capable. Many of these tasks require the use of Microsoft Word, Excel, PowerPoint, Access, MS Project, Photoshop, and social media tools. Established nearly 50 years ago, NUSACC is America’s longest serving organization dedicated to U.S.-Arab business. NUSACC is widely regarded as the voice of American business in the 22 countries of the Arab world and the premier portal to the United States for Arab commercial enterprises. NUSACC is a non-partisan, non-profit organization that is registered under U.S. law as a 501 (c) (6) chamber of commerce. Please send a completed application form, a cover letter, a one- to two-page writing sample, a resumé, and two letters of reference to rmogharbel@nusacc.org. Please include the word ‘internship’ in capital letters in the subject line of your E-mail, as well as your name. With the exception of the two reference letters, please submit all information in one file (Word or PDF). Applications from candidates communicating professionalism, enthusiasm, attention to detail, and a background in trade data analysis will be given preference. Applications are due on March 15 for summer internships; on June 15 for fall internships; and on October 15 for spring internships.